An appeals court ruled correctly when it reversed a nearly $2 million judgment against a Cypress neurosurgeon, the Texas Medical Association is telling the Texas Supreme Court in a friend-of-the-court brief. Fifteen years later, the power of Texas' landmark tort reforms still shows up in both the numbers and the attitudes of physicians across the state. There are some obvious reasons physicians could face a medical liability lawsuit — surgical errors, misdiagnosis, and medication errors are some of the most common. But other issues related to communication, documentation, and staff conduct, also increase your legal risk. The video below — published by the Texas Medical Liability Trust and hosted by its Vice President of Risk Management Lesley Viner— covers the top five common issues that could leave you open to a medical liability lawsuit. TMLT, the only medical professional liability insurance provider created and exclusively endorsed by the Texas Medical Association, is a self-insured, not-for-profit trust that provides reliable coverage against medical liability claims and more. Call (800) 580-8558, (512)-425-5800 or visit www.tmlt.org for more information. Thanks to the Texas Supreme Court's decision in Perkins v. Skapek, physicians employed by a government institution still can perform clinical duties at a non-government facility without giving up immunity from lawsuits. Physicians' liability insurance premiums have continued to drop since the passage of Proposition 12 and our landmark 2003 health care liability reforms. All major physician liability carriers in Texas have cut their rates by more than 30 percent. Texas physicians have seen their liability rates cut, on average, 46 percent. Cumulative liability cost savings since January 2004: $1.9 billion. 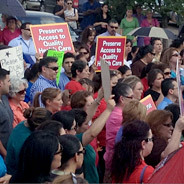 Physicians, hospitals, and other health care providers throughout Texas would lose substantial protections against frivolous medical lawsuits if a bill working its way through the nation's capital becomes law, two Texas medical groups say. The New Mexico Supreme Court ruled Monday in favor of a Lubbock physician entangled in a question of whether Texas or New Mexico law should apply in a liability case involving care that was provided in Texas but for a New Mexico patient. The passage of House Bill 270 by the New Mexico Legislature allows Texas physicians to obtain a signed agreement from New Mexico patients stating that should they wish to file a lawsuit they will do so in Texas court. To assist physicians in taking advantage of the law's protections, TAPA has developed two forms, one for emergency treatment and one for voluntary treatment. Last month, TMA signed on to the Texas Alliance for Patient Access' (TAPA's) friend-of-the-court brief to support the application of the willful and wanton standard in a lawsuit involving emergency obstetrical care. TMA, TAPA, and other signatories contend emergency care provisions apply to medical care provided in an obstetrical unit without the pregnant patient first having been evaluated in a hospital's emergency department. TMB finished its fiscal year last month having received a record number of new physician applications. TMB received 5,544 new applications, up 3 percent from the previous year's record 5,377 applicants. Let the TMA Knowledge Center alert service keep you up-to-date with the newest articles and latest developments in professional liability. Knowledge Center staff create custom searches set to run each week. The results of these searches are emailed directly to you, or accessed via RSS feed. TMA Knowledge Center alerts provide citations and abstracts along with some full-text access. A doctor sued for negligence for a procedure he performed in Texas will have to defend himself under the law of … New Mexico? Right now, that's the situation in which Eldo Frezza, MD, finds himself. The bariatric surgeon faces several similar suits filed not in Texas, where he performed surgery on the patients, but in New Mexico, where the plaintiffs live.